NASA's NEOWISE spacecraft opened its "eyes" after more than two years of slumber to see the starry sky with the same clarity achieved during its prime mission. 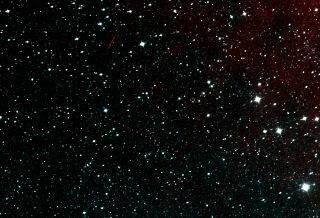 This image of a patch of sky in the constellation Pisces is among the first taken by the revived spacecraft's infrared cameras, and shows the ultimate target: asteroids. Appearing as a string of red dots, an asteroid can be seen in a series of exposures captured by the spacecraft. A NASA asteroid-hunting spacecraft has opened its eyes in preparation for a renewed mission, beaming home its first images in more than 2.5 years. The Near-Earth Object Wide-field Infrared Survey Explorer spacecraft, or NEOWISE, has taken its first set of test images since being reactivated in September after a 31-month-long hibernation, NASA officials announced today (Dec. 19). The space agency wants NEOWISE to resume its hunt for potentially dangerous asteroids, some of which could be promising targets for future human exploration. "Over the next weeks and months we will be gearing up our ground-based data processing and expect to get back into the asteroid-hunting business, and acquire our first previously undiscovered space rock, in the next few months," Mainzer added. NEOWISE began its scientific life as WISE, which launched to Earth orbit in December 2009 on a 10-month mission to scan the entire sky in infrared light. WISE catalogued about 560 million celestial objects, ranging from faraway galaxies to nearby asteroids and comets, NASA officials have said. WISE ran out of hydrogen coolant in October 2010, making two of its four infrared detectors inoperable. But NASA didn't shut the probe down at this point; rather, the agency granted a four-month mission extension known as NEOWISE, which focused on hunting asteroids. (The satellite could still spot nearby objects with its other two detectors, which did not have to be super-cooled). This is one of the first images captured by the revived NEOWISE mission, after more than two years of hibernation. It shows a patch of sky in the constellation Canes Venatici, or the Hunting Dogs. The galaxy seen near the center is NGC 4111, the largest member of a small group of galaxies located 50 million light-years away. NEOWISE discovered more than 34,000 asteroids and characterized 158,000 space rocks before being shut down in February 2011, NASA officials said. And the spacecraft is now gearing up for another three-year space-rock hunt, partly to help find potential targets for NASA's ambitious asteroid-capture project. This "Asteroid Initiative," which was announced in April, seeks to drag a near-Earth asteroid to a stable orbit around the moon, where it would be visited by astronauts using the agency's Space Launch System rocket and Orion crew vehicle. The plan represents a way to meet a major goal laid out by President Barack Obama, who in 2010 directed NASA to get astronauts to a near-Earth asteroid by 2025, then on to the vicinity of Mars by the mid-2030s. NEOWISE employs a 16-inch (40 centimeters) telescope and infrared cameras to find previously unknown asteroids and gauge the size, reflectivity and thermal properties of space rocks, NASA officials said. "It is important that we accumulate as much of this type of data as possible while the spacecraft remains a viable asset," said Lindley Johnson, NASA's NEOWISE program executive in Washington. "NEOWISE is an important element to enhance our ability to support the [asteroid] initiative."